We know it’s coming — Verizon’s CEO is flashing it to random college students around NYC, RIM is updating BIS infrastructure, and there’s been a ton of release dates flying around. 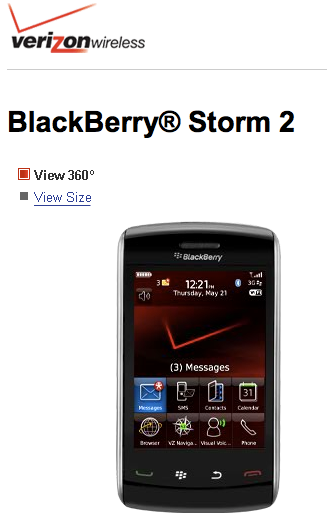 However, it now looks like Verizon Wireless’ web team is jumping on the Storm 2 bandwagon as well. Last night the Storm Part Deux made it’s debut on the VZW website — all 360 degrees of it. Take er’ for a spin, won’t you? Also, if you’re up for it, we’d love to know if you are an original Storm owner and are planning to get the new Storm2 over the BlackBerry Tour or Motorola Droid. Hit us up!